I was given a free copy of this book in exchange for my honest review. All opinions are my own. I am so very excited to bring this giveaway to you today. 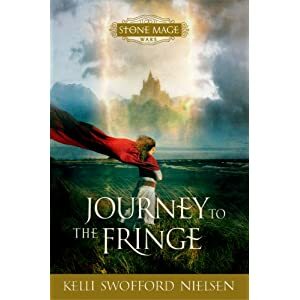 Today’s giveaway is of the book Journey to the Fringe. It is a first in the series of the Stone Mage Wars. I loved this book. It really reminds me of a cross between Lord of the Rings and Harry Potter. It is a fantasy book. It has magic, princesses, good and evil. It has heroes and heroines–characters willing to sacrifice the ultimate sacrifice for the good of others (this is how it reminds me of LOTR). The writing style is simple yet sophisticated. There is nothing said that is not important to the story. Any description is necessary. There is a lot of action and dialog (this is how it reminds me of Harry Potter). Another thing I love is that this book is clean–I would let Brayden read it. Isn’t it hard to know with new books that come out what is safe and what isn’t? You can’t just go by what people are raving about–there are plenty out there you can start to read based on recommendations and find the subject matter is quite questionable. This book is not questionable. So a great book to giveaway to you. This is definitely worth the read and worth owning. And an extra bonus as to why I am so excited about it is that it is written by my good friend Kelli Swofford Nielsen. Kelli and I have known each other since middle school. We sang in choirs together throughout high school. We even attended the same university and had several classes together since we were both English majors. In college we got to be great friends. This carried into marriage and especially motherhood. She is a fellow Babywise mom and Kelli was my sounding board when Brayden was a baby. She has written a guest post here before (see Milk Supply Limit). There is one downside–this is a series and this is only book one. And a new release. So we have some time before book two. I hate waiting. At least this book doesn’t leave you high and dry–it wraps up nicely. I guess the good news is that the story isn’t over at the end–you just have to wait to read the next one. Today, Kelli is giving away TWO copies of her book! And not just copies, but two personalized, autographed copies. So let’s enter. Visit Kelli’s website. http://www.kelliswoffordnielsen.com/ Comment saying you did so. Free Entry! But you must enter. http://www.facebook.com/kelliswoffordnielsen Comment saying you did so. Entries will be accepted until I choose the winner sometime September 21. The winner will be announced Friday September 21. I like KSN on FB! I like CoBM on FB! I like Chronicals of a Babywise mom!